Butterscotch is the best flavor option for a cake for those who are not a fan of chocolate or just want to try something different. 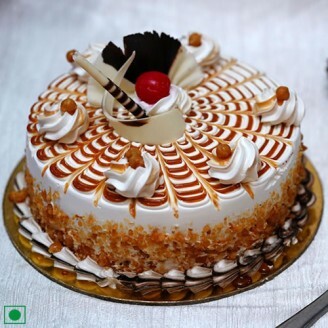 If you want to send beautiful butterscotch cake Jaipur to your family or friends, just let us know. Gift Jaipur provides you a platform from where you can buy cake sitting at home without any hassle. You can order a cake from our website and have the cake delivery at your doorstep. Cake online ordering can be risky, but you can trust us blindly. We will provide you the best quality egg less cakes. As the eggless cake is a trend now, buy a butterscotch eggless cake for a change.